Mackinac Island MI is a 4 sq mi/10 km2 island. It is located on the eastern side of the Straits of Mackinac. Long home to various native peoples, its first European visitors were French Jesuits in 1670. With the establishment of the Jesuit mission, the island became an important link in the French fur trade business. After the French-Indian War (also known as the Seven Years War), the area passed into British control. In 1780, the British built Fort Mackinaw. Following the American Revolution, the region was transferred to the new USA by the Treaty of Paris. It was retaken by the British in the War of 1812 and returned again to the United States in the Treaty of Ghent. Following the American Civil War, visitors began to come into the area, attracted by the tremendous natural beauty. As tourism grew, mush of the land was designated as a natural park. This was eventually transferred to the State of Michigan and today some 80% of the island is parkland. Today, Mackinac Island MI is a major tourism destination. The population swells from a permanent base of about 500 to nearly 1 million each summer. Note: Due to its popularity, reserving a slip ahead of time is a virtual necessity. The harbor is located at the southern end of the island. Approaches are made from either the west or east, through the passage separating Mackinac Island and Round Island. Note: This passage is heavily used by freighters and fast-moving ferries. Keep a sharp lookout. 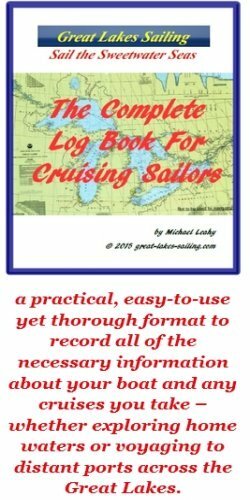 Approaching from the west, through the Straits of Mackinac, be aware of three large, charted shoals: North Graham Shoal, South Graham Shoal and Majors Shoal. North Graham Shoal is marked with a Fl GREEN light. South Graham shoal is marked with a RED buoy. Majors Shoal, which lies SE of South Graham Shoal is marked with a Fl GREEN light. There is a charted range showing a course of 249.5°T which will bring you abeam the Fl RED buoy, visible approximately 9.8 nm. When you pass this marker buoy, to the NE you will see a Fl GREEN light that marks the southern end of the west breakwater. Once abeam the breakwater light, alter course to approximately 345°T and head directly to the state dock. Follow a course of approximately 050°T to the Round Island Light - a Q GREEN. From the Round Islan Light, a course of approximately 033°T will bring you into the harbor entrance. From the harbor entrance, a course of approximately 335°T will bring you to the state dock. Note: This course takes you over the charted Majors Shoal. It has a charted depth of 10 feet but you can alter course to either the west or the east if you choose. Both ends of the shoal are marked. Keep well off Bois Blanc Island. Charted depths can range from 20 feet to 3 feet. The east breakwater is marked with a Fl RED light. Once abean this light, alter course to approximately 320°T to come in to the state dock. Sail south until you are abeam the Q RED light off the SE tip of Mackinac Island. Once clear of that light, a course of approximately 256°T will bring you abeam the east breakwater light. From there, a course of approximately 320°T will bring you in to the state dock. The State Dock is a very busy dock. Usually full every night, advance reservations are highly recommended. This is exacerbated at the end of the Chicago-Mackinac and Port Huron-Mackinac races. There is no fuel dock. Gasoline is available on the east side of the harbor, at what is known locally as the 'coal dock'. A pumpout station is available. There are water and electrical hookups at the slips. The dock has restrooms and showers and there are BBQ grills on-site. There is an anchor ground in the harbor. The holding is fair and dragging is not uncommon. The anchorage is exposed to wakes from the ferries that arrive and depart throughout the day. There are no marine repair or maintenance facilities on Mackinac Island MI. Doud's Market is located about a block from the state dock. Billed as 'America's Oldest Grocery Store', Doud's also offers a delivery service to the docks. Central Savings Bank is located about 3 blocks from the state docks. It has counter and ATM service. Mackinac Island Health Center (906) 847-3962 is located about 4 blocks from the state docks. Alford's Drug Store (906) 847-3881 is located about 4 blocks from the state docks. As a major tourist center, Mackinac Island MI has a wide range of places to eat. The Grand Hotel is an elegant hotel, known for claiming to have the longest porch in the world. They take their dress code very seriously and even charge a fee for non-guest tourists to enter the hotel. The Chippewa Hotel is a historic building and home to the famous Pink Pony Lounge where finishers of the Mackinac races gather to celebrate. The Island House Hotel is home to the 1852 Grill Room with its outdoor patio overlooking the water. Horn's Gaslight Bar & Restaurant has entertainment nighly. If you enjoy good beer, The Draught House has 50 craft beers to tap. As well as these and other interesting restaurants & bars, Mackinac Island is famous for its fudge. In fact, tourists , especially those who arrive by ferry, are known locally as fudgies. There are numerous shops where you can sample this sweet-tooth treat. Mackinac Island MI is designed for walkers and cyclists. Other than emergency vehicles, there are no automobiles allowed on the island. There are bicycles, carriages and horses available though. There are walking tours that take in both the town and the surrounding area. One bicycle tour can take you around the perimeter of the island. A must-see is Fort Mackinac. Built by the British during the American Revolution, the fort controlled the Staits of Mackinac and the vital fur trade routes from Lake Superior. After the independence of the United States, the fort was turned over to the Americans. At the outset of the War of 1812, the British recaptured the fort from the Americans and 2 years later successfully fended off an American attack. Following the war, the fort once again was transferred back to American control. It remained a garrisoned fort until 1895. The rest of the island became the second national park in the United States. Following decommissioning, the fort and the park were transferred to the State of Michigan. Today, you can enjoy tours and re-enactments at this very historic site. Throughout the summer, there are music festivals, performing arts events and tours. The Mackinac Island MI tourism site will give you an idea of lots more things to do and see while visiting the area.